Ripping, tearing, shredding, mixing, matching, blending . . . artist-illustrator Sabini has collaged his way from Italy to the U.S. with his previous activity book Paper Zoo. His artwork is bright, odd, funky, trendy, and inviting. 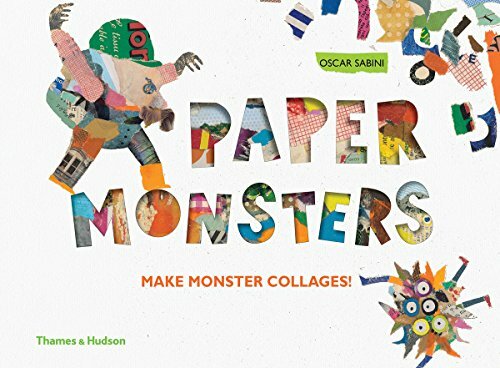 Intended for four to nine year olds, Paper Monsters is another activity book and the perfect imagination station for a slow, quiet day. Bring a glue stick, which is all one needs to supply, and let ’em rip . . . literally, the paper that is supplied in a tidy envelope in the back cover of the book. 6 - add eyes, nose, teeth if you want. The next eight pages are actually envelopes (or pockets) with different diecut monster shapes waiting to hold each collaged card. On the facing page, Sabini has provided his own collaged example of said monsters. First used by Cubist painters Georges Braque and Pablo Picasso in the early 1900s, collage (French for “glue”) became a distinctive part of modern art. Famous artists such as Henri Matisse, Jean Dubuffet, and Juan Gris led the way for the success of children’s book collage artists such as Eric Carle, Leo Lionni, Lois Ehlert, and Bill Martin. Collage is hugely popular in digital and photography art and remains interesting and attractive for all ages. With such widespread appeal, paper collage in particular is perfectly suited to little hands learning motor skills and dexterity, building confidence and experiencing tactile stimulation; it is impossible to mess this up or make a mistake. While the project aspect of this book is just right and entirely do-able, the story is bland and nonexistent. It would have been better to have a plot, a conflict, or an adventure to carry readers along. Nonetheless, as a forgiving medium, the collage activity lures youngsters toward an artistic achievement if not a literary one. They will have the opportunity to complete the book’s artwork, becoming illustrators themselves, as they meet each monster and find out where they are headed at the end of this simple collection.